Video clip synopsis – In his first great voyage of discovery, James Cook is chosen to find and explore the 'Great Southern Land'. Broadband MP4 cookgsc_bb.mp4 (6.1MB), suitable for iPods and computer downloads. 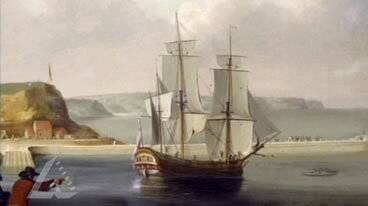 Great Southern Continent is an excerpt from A Likely Lad, the first episode of the 4 x one-hour series Captain Cook – Obsession and Discovery, produced in 2007. This excerpt marks the most significant turning point in Cook’s life, his selection as Captain of the Endeavour to embark on a voyage of discovery for the British Royal Navy. This was one of the British Empire’s first great scientific expeditions, to study the Transit of Venus in the Pacific Ocean and chart the ‘Great Southern Continent’. The narrator of the series, Vanessa Collingridge, describes the 18th Century legend of the ‘Great Southern Continent’ and why Cook was chosen to find and chart it. Cook had emerged as a superb navigator, one who could best be relied upon to find any southern lands as he was an outstanding cartographer and would be able to map it accurately. In the excerpt, Professor John Gascoigne from the University of NSW describes the thirst for land and power that had increased greatly in the 18th Century. Gascoigne explains how Britain hoped to reap the riches of the legendary southern continent just as Europe had already secured with the discovery of America. The choice of Cook, who at the time was just a ships’ master, was a calculated one based on his skill rather than patronage. The excerpt reveals the fortuitous choice of Cook’s ship the Endeavour, a Whitby cat with a flat-bottomed keel, only 35 metres long (equivalent to the length of 7 family cars). The Whitby cat had traditionally been used to carry coal from Whitby to the Thames and back loaded with timber. Cat is an acronym of “coal and timber ship”. This type of ship had been Cook’s “classroom of the sea” where he had learnt the seaman’s trade. This resource is also relevant to Media Studies- Documentaries, Australian History, Geography and Visual Arts. The series relives what it was like to navigate uncharted and unknown waters in search of a legendary ‘Great Southern Continent’ and then a North West passage through the Arctic ice; as well as to be among the first Europeans to visit exotic Pacific islands like Tahiti. The harshness and danger of life on the sea is depicted graphically as well as the rigid social structure of the time. The series includes direct descendants of the indigenous peoples of Australia, New Zealand, Canada and Hawaii who Cook met 240 years ago and the men of the Endeavour, Resolution, Adventure and Discovery, particularly the famous gentleman botanist Joseph Banks and the young William Bligh. The documentary’s point of view in regards to Cook. What spoken , visual and written text elements contribute to this view? the knowledge of the geography of the world before Cook set out on his first voyage? View the opening 3D images of the globe of the Earth as people in the 18th Century conceived of it. Is this a more powerful representation that using a map? What production elements are used to represent the unknown southern part of the globe; consider colour, use of light and dark and shot size and movement. the imagined riches of the Great Southern Continent? Consider the symbolic use of mythical animals, wealth and power and how they are represented as pop ups on a map. the ship chosen for Cook? Why is a painting of the ship used at this point in the documentary? How does it contribute to the visual style of the clip? How the various production and visual conventions in this clip are used to convey the information – for example, paintings, maps, digital images, interview to camera and narration. What modes and their styles, used in this multimodal text, indicate it was produced recently? Write a diary entry for Cook or another Australian explorer that celebrates an important event in their lives. Research the explorer’s life using library resources: books, articles, DVDs etc and the Internet) see below for some recommended sites). Storyboard a short scene in which Cook takes command of the Endeavour or sets sail. Produce a short video (students could use DVD cameras or mobile phones) based on the clip, that dramatises Cook being given the news that he is to find the Great Southern Land. The video is to use only close ups. Go to Endeavour-Captain Cook’s Journal 1968–71 to read from Captain Cook’s handwritten journals. Go to Project Guttenberg of Australia for extracts online from the journals of Australian explorers.